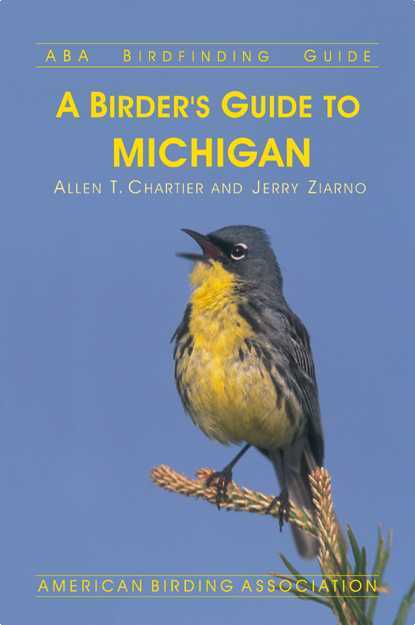 A Birder's Guide to Michigan (ABA Birdfinding Guide Series) can be purchased from the American Birding Association (ABA). Call ABA Sales at 800-634-7736 to order Item #288 or go to the ABA Sales web page. See this page for updates and corrections. Many birders come to Michigan with the intention of adding Kirtland's Warbler to their life lists - but the state should by no means be dismissed as a "one species wonder." Surrounded by four Great Lakes, Michigan boasts 3,000 miles of shoreline. Add the additional habitat afforded by 11,000 interior lakes, 36,000 miles of rivers and streams, and the largest state forest system in the nation, and it's not surprising that Michigan's official bird list now stands at 421 species. A Birder's Guide to Michigan describes over 200 sites, with details on each site's birds, best seasons, and driving directions, accompanied by 200-plus maps. Thoroughly researched bar graphs describe the seasonal status and abundance of the state's regularly occurring species, and an annotated list of specialties will guide birders to some of North America's most sought-after species. A bonus is an appendix listing the state's amphibians and reptiles, butterflies and dragonflies, mammals, and orchids - Michigan is home to a stunning and sometimes rare assortment of these gorgeous plants. Allen T. Chartier has been birding in Michigan since age 11. He has been the Autumn compiler for the Michigan Bird Survey since 1997, served six years on the Michigan Bird Records Committee (1998-2003), and was Managing Editor of Michigan Birds & Natural History from 1997-2001. In addition to being one of Michigan's top listers, Allen has birded in 26 countries on 6 continents. He has previously self-published Hawks of Holiday Beach (a Canadian hawkwatch site), and coauthored Birds of Detroit. His current project, the Michigan HummerNet, is a statewide research project designed to learn more about Rubythroated Hummingbirds through the use of observations from volunteer observers and banding studies. He balances his intense interest in ornithology with a passion for herpetology, botany, and entomology. Born and raised in Saginaw, Jerry Ziarno has lived most of his life in Michigan, interrupted only by a tour of military duty in Japan and business positions in Belgium, Japan, and Hong Kong. At an early age, he acquired a love of nature from his father, and went from being an avid hunter to studying birds through binoculars. Graduating from Michigan Technological University with a B.S. in Electrical Engineering, he went on to obtain a Master's Degree in International Business from Sophia University in Japan and also attended the Executive Program at Stanford University. He is a former board member of ABA and has served on the boards of the Chippewa Nature Center and the Midland Nature Club. A retired former Vice President of Marketing at Dow Corning Corporation, he has traveled extensively throughout the world as well as in the U.S., enjoying his birding avocation. With two grown children, Jerry and his wife, Yoshie, spend much time on the small nature preserve in their backyard in Midland, Michigan. Go back to the FAQ for birders@umich.edu.